Looking for Affordable Housing (to rent or buy) in Manhattan? Gotham Organization, Inc. is developing almost an entire city block between West 44th & 45th Streets and 10th & 11th Avenues. Known as the Gotham West, this LEED project includes approximately 1,240 rental units housed in 4 buildings, a 200 space below-grade parking garage and approximately 17,000 square feet of retail. Over the last several years, Gotham has worked with the City of New York, Community Board 4, and the City’s governing agencies to rezone the site from manufacturing to residential use. The development will include a 31-story tower located on 11th Avenue with approximately 700 units as well as neighborhood retail and below-grade parking. Adjacent to the tower, another mid-rise building will house 297 affordable housing units available to low, moderate and middle income families. Further east towards 10th Avenue, two 14-story buildings will be situated atop a platform over Amtrak train tracks and will include an additional 243 units of affordable housing. The buildings are being constructed through the Inclusionary Housing Program of the City’s Housing Preservation and Development department, with financing provided by the New York State Housing Finance Agency. “Inclusionary housing” refers to the creation of permanently affordable housing as a result of zoning mechanisms (such as re-zonings, text amendments, zoning variances, etc.) that allows real estate developers to build highly profitable, market-rate residential projects. 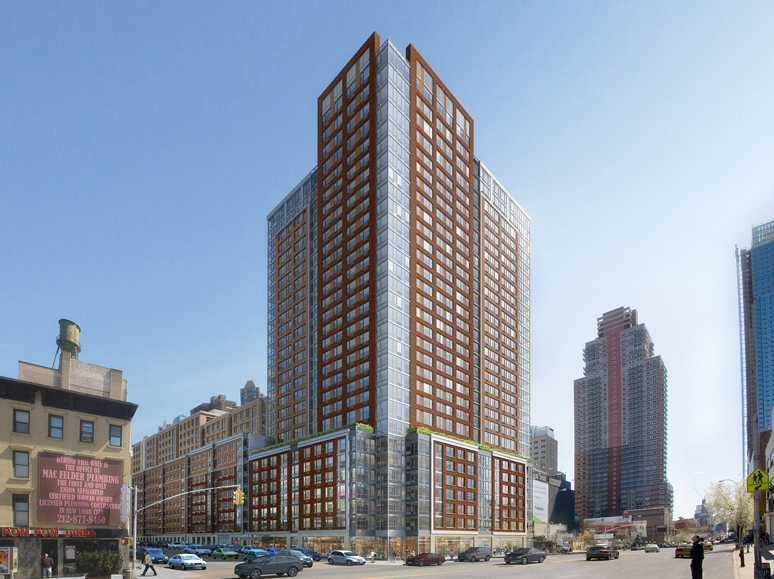 In the case of Gotham West, 682 units (out of 1,240 total units) will be permanently affordable!! For example, fifteen studios will be offered for as little as $494 per month, 14 one-bedrooms for $533 and 9 two-bedrooms for $648 per month. Please visit www.West45Lottery.com for details on the size, rent and income requirements of all 682 permanently affordable units. Applications must be postmarked by November 13, 2012. The Park Clinton is a new 96-unit middle-income cooperative building located on 52nd St. between 10th and 11th Aves. It will provide one and two-bedroom apartments that will be priced to be affordable for New Yorkers with incomes between approximately 80% of Area Median Income (AMI) and 195% AMI (which today ranges from under $45,000 to just over $160,000, depending on household size). Community Board 4 residents (which rougly encompasses the areas from West 14 Street to 59 Street and from 8th Avenue to the Hudson River) will be granted priority for half of the units. This means that if you are currently a rental tenant in Chelsea, Clinton or Hell’s Kitchen (and you financially qualify to purchase one of these coops), you will be given the opportunity to do so over other applicants who currently live elsewhere. For example, eight 1-bedrooms will be sold for $128,500 and seven 2-bedrooms for $152,000. Please visit www.theparkclinton.com for details on the size, income, assets and purchase prices of all 96 units. These two buildings have been in the planning stages for years. During that time, many meetings were held between the developers and the Land Use committee on which I sit, to work out the details. So I’m ecstatic to see both of these projects finally take off. Occupancy is estimated for 2013.